Astoria resident Tish Cassella said she supports the idea of a new dog run in the neighborhood where she could bring her doberman, Apollo, pictured here. ASTORIA — When it comes to places for pooches to play, Astoria's pretty ruff. Hundreds of local pet owners have signed an online petition calling for a new dog run in the neighborhood — saying they'd like to see a space similar to the amenities-filled dog parks found in other neighborhoods. "The Astoria community needs an adequate area to allow their dogs to socialize and exercise off-leash," the Change.org petition to the Parks Department and City Councilman Costa Constantinides reads. It had 381 signatures as of Monday afternoon. The only dog run in Astoria currently is a small fenced-in space near Astoria Park known as "Bugsy's Dog Run" on Shore Boulevard and Astoria Park South. But locals say it's too tiny and run-down to accommodate the needs of pet owners in the area, and Yelp reviews of the space complain of rusted fences and ground that turns muddy after it rains. Astoria Park offers daily off-leash times for dogs from 6 to 9 a.m., but local pet owners say they need somewhere else for their pooches to stretch their legs. They also want a run that offers amenities like benches, separate areas for big and small dogs and a source of drinking water for the pups, among other features. Astoria resident Bill Peloquin, 26, said he started the petition after taking his Pembroke Welsh corgi puppy, named Murray, to the Hunters Point dog run, which had perks like a water fountain and separate areas for different sized dogs. "If you look just outside of Astoria, you’ll see that lately there have been new dog runs popping up in LIC and other Queens neighborhoods," he wrote in an email. "If other communities managed to get one built, I don’t see why we can't." Peloquin said he went online to gauge neighborhood support for the idea, launching the petition after getting positive feedback from fellow pet owners. He meet with several of them recently to start organizing, he said. In an email, a Parks Department spokesman said the agency would consider allowing a dog run in Astoria Park itself "with the approval of the Community Board, and the presence of an organized community group that could maintain the dog run and enforce rules regarding its use." But if the Parks Department added a dog run to Astoria Park, they would have to suspend the park's current off-leash hours, according to the spokesman. Peloquin said he and his fellow dog owners don't want to lose off-leash hours at Astoria Park, so they are looking for alternative locations for a dog run. "The entire group was in agreement that we did not want to push for a park that would jeopardize off-leash hours," he said in an email. "So the most likely solution will be to look to other areas near the park (but not in it) where we could build." Constantinides said he's in the "early stages" of scouting potential locales for the dog run. "As a longtime animal lover and dog owner, I know the importance of having controlled and well-maintained places for our pets to run freely and safely," he said in a statement. "We are in the early stages of researching this issue and are considering possible locations for a good dog run in Astoria." 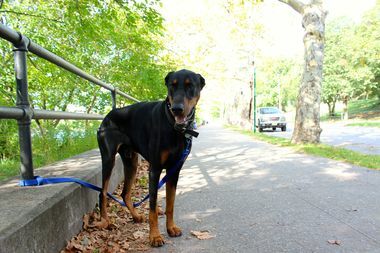 Tish Cassella, who was walking her Doberman, Apollo, in Astoria Park recently, said she supported the idea of a new dog run in the neighborhood. "It would be nice," she said, saying she'd like to see a space similar to other dog parks she's seen that have water fountains and sprinklers for the dogs to cool off in. "I don't see why we can't do the same."